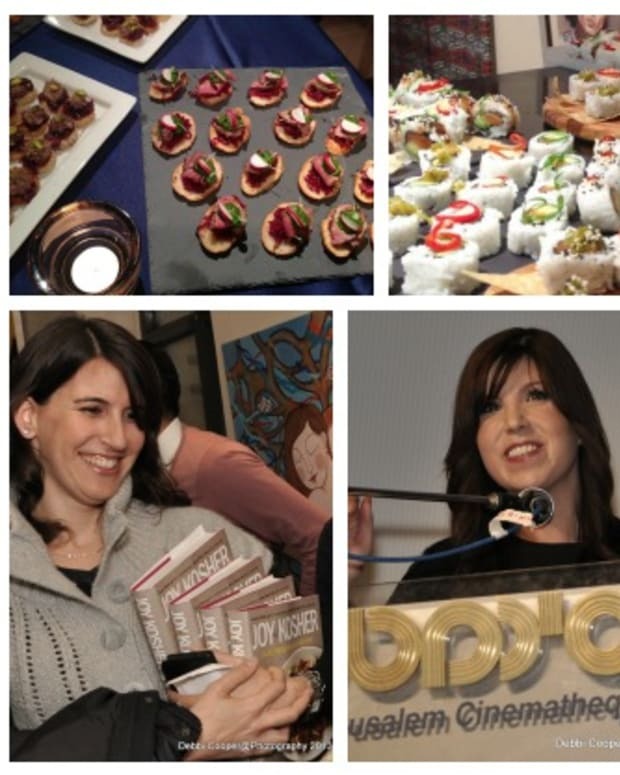 In anticipation of the release of the new Joy of Kosher Cookbook we arranged for 10 cookbook clubs around the country. We asked and you volunteered. 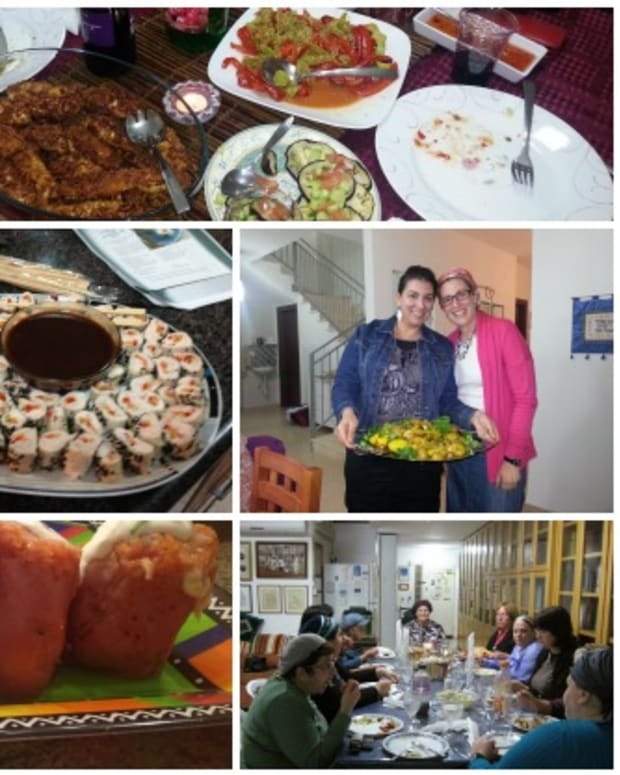 The volunteers that were randomly selected from our Host a Joy of Kosher Cookbook Club were tasked with inviting at least 5 friends to talk, cook and eat from the new book. 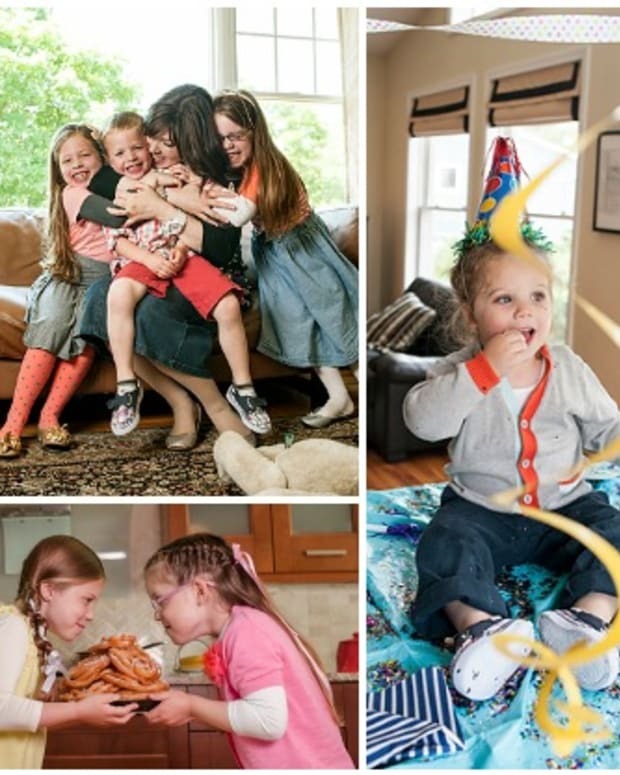 Here is a recap from some of there parties and we hope they inspire you to host one of your own. 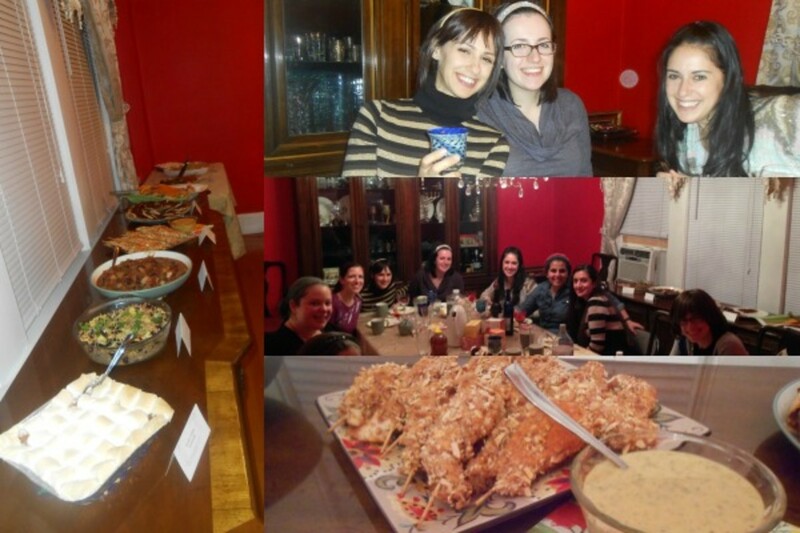 We had a fantastic ladies night dinner here in Elizabeth, NJ. It was an evening of great food, wine and friends. Our feast included appetizers, entrees, and desserts from Jamie’s cookbook so we were able to get a well-rounded taste of the recipes throughout the book. 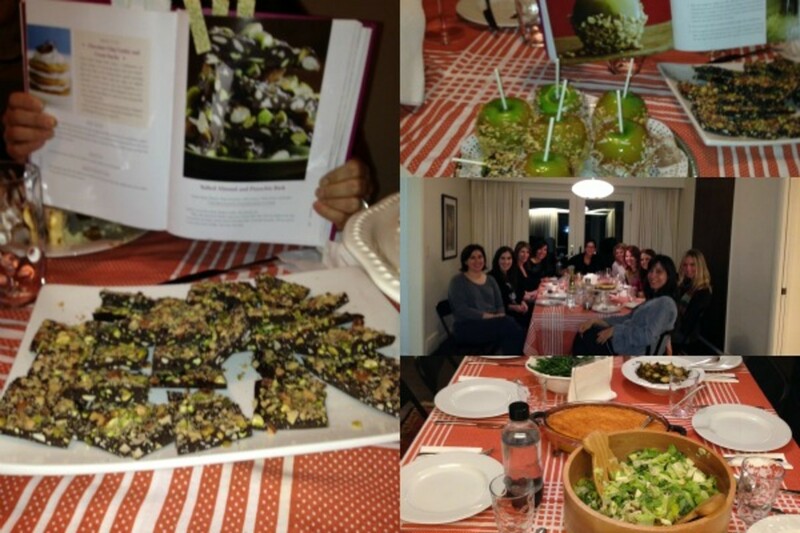 Each of the 13 participants selected a recipe in advance and brought their dish over on the night of the dinner. We set up the dinner buffet style with little signs next to each dish identifying the recipe. Everyone was able to try the different items and each one was a true hit. Throughout the meal people commented on how easy the recipes were to follow. A few of the delicious foods we got to sample were “Tropical Fruit Guacamole”, “Anita’s Lachmajine”, “Chunky Red Chili”, “Sweet and Sticky Chicken Drumsticks”, and “Sweet Potato Cake”. 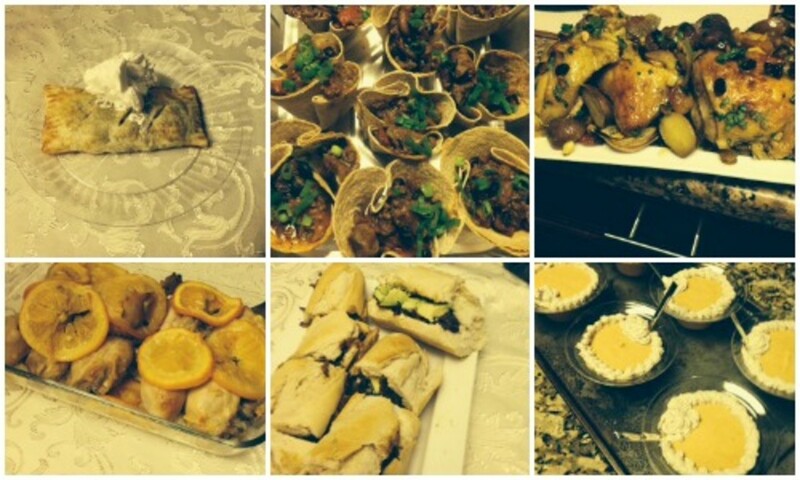 We all had a terrific evening and were so glad to be able to take part in this beautiful and scrumptious event!
. 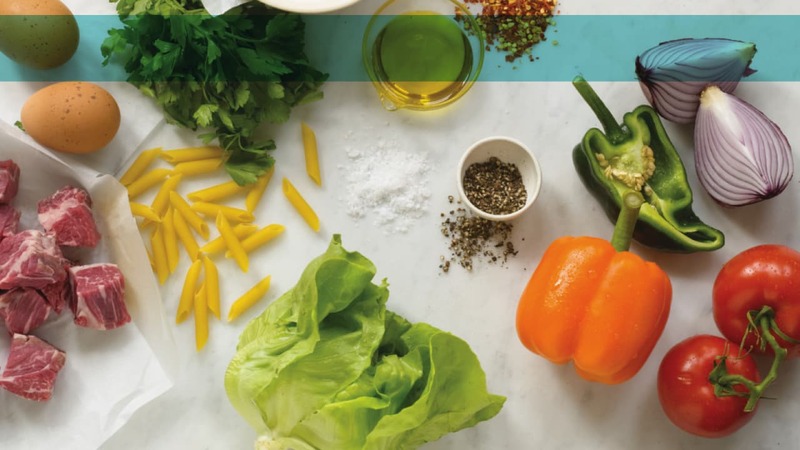 When I learned I won the &apos;contest,&apos; I was so excited since I love cooking, love my friends, and love new recipes! The challenge for my friends was my gluten-free diet. Since I was diagnosed with Celiac in February, I&apos;ve had at least one meal in each of these friend&apos;s homes and they&apos;ve been troopers at learning how to substitute to make it all work. So, I went through the cookbook, and picked about 25 recipes that could easily be made gluten-free (or were GF naturally). I made the two main dishes and a dessert. I then texted each friend 2 recipes, so they could pick what they wanted. We ended up with a great dairy dinner! We had: Lemon Lovers Hummus, Waldorf Salad, Cilantro Corn Cakes, Rice Salad, Brussel Sprouts, Green Beans, Teriyaki Trout, Mac n&apos;Cheese, Cornbread....and for dessert, Orange Cheesecake, Brownies, Pistachio bark and Caramel Apples. (Did I mention that EVERYTHING was Gluten Free?) Honestly, everything was delicious. I wish I could say we went around and introduced each dish, but with a dozen working moms out on a &apos;school night,&apos; we were so excited to just sit, talk and eat good food that we didn&apos;t get around to it! We did commit to trying this again, with other cookbooks (hopefully from Jamie!). With a group of good friends we had an early Thanksgiving feast in Washington Heights, NY. 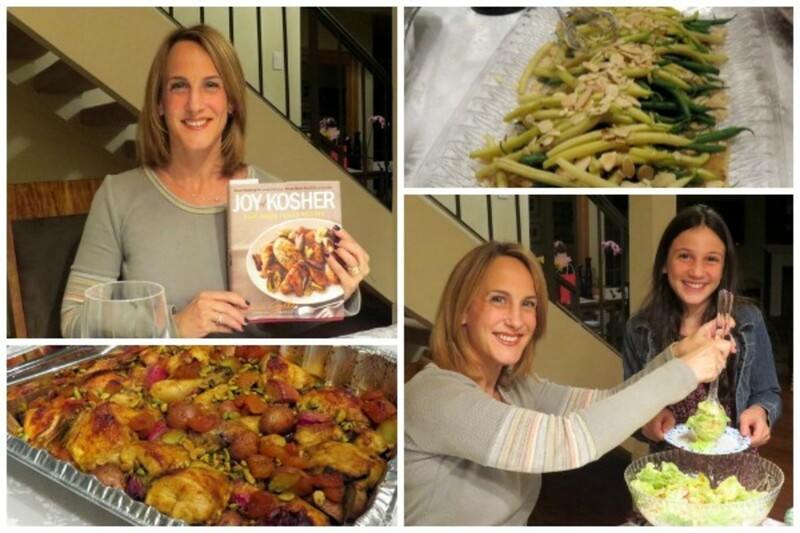 During supper we passed around a copy of the new Joy of Kosher cookbook. Everyone introduced their own dish and described the recipe and preparation process. The winter citrus salad was beautiful and a wonderful fresh start to the meal. We gobbled up the moist turkey, savory rice salad and creamy sweet potato pie. The green beans were a hit with a bit of kick (too much for some and many agreed to omit the chili pepper next time)! For dessert, the autumn theme continued with the parve pumpkin mousse and cardamom scented cookies. Good quality chocolate and sea salt was key to making the Salted Almond & Pistachio Bark. Thank you and looking forward to cooking again for the Joy of Kosher. Thank you to Rachel Jonas for taking such beautiful pictures of all your delicious creations. 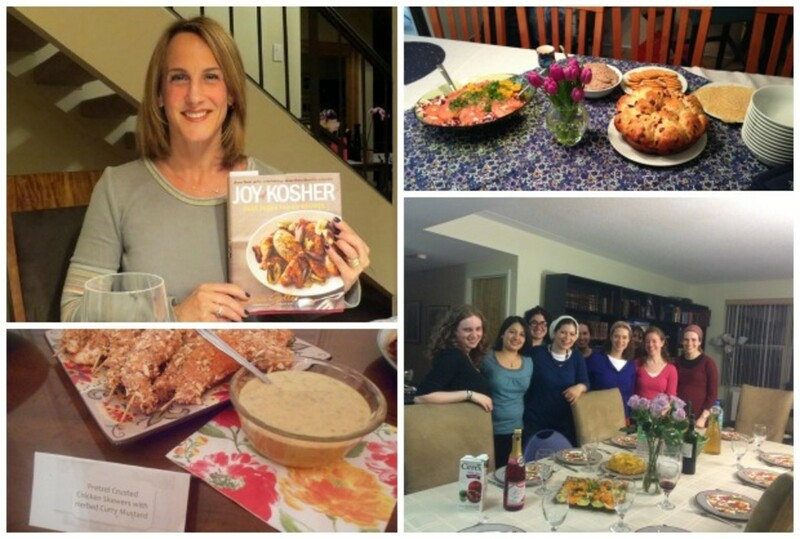 Our Joy of Kosher Cookbook party was on October 27th. 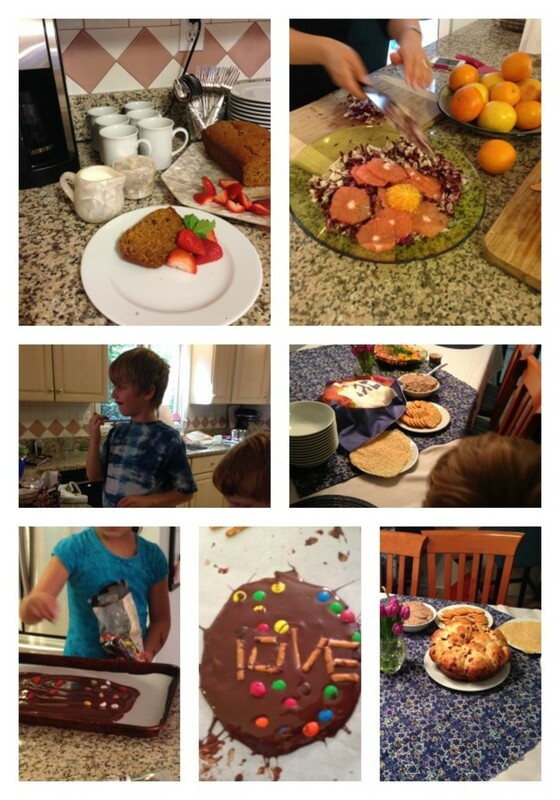 We had four moms and their kids at our home for a lovely brunch. We picked a morning time frame so that the kids would all be happy playing together, and picked recipes from the cookbook that would make a great veggie/dairy lunch with leftovers to take home. I had coffee and the sweet potato cake ready for everyone when they arrived. The Sweet Potato cake received rave reviews! It is easy, delicious, and everyone kept eating more and more until we had a small end piece left (which my husband promptly wrapped up to take to work the next day). Needless to say, everyone was paging through the book to find that recipe! One of the moms had brought the Veggie Chopped Liver, and again, everyone was thumbing through the book to find the recipe since it was so unbelievably good! Every person I have met always mentioned some weird frozen peas recipe for veggie chopped liver, and this was definitely not it! This dish rivaled my Romanian-Israeli Savta&apos;s recipe for chopped liver, it was really that good! 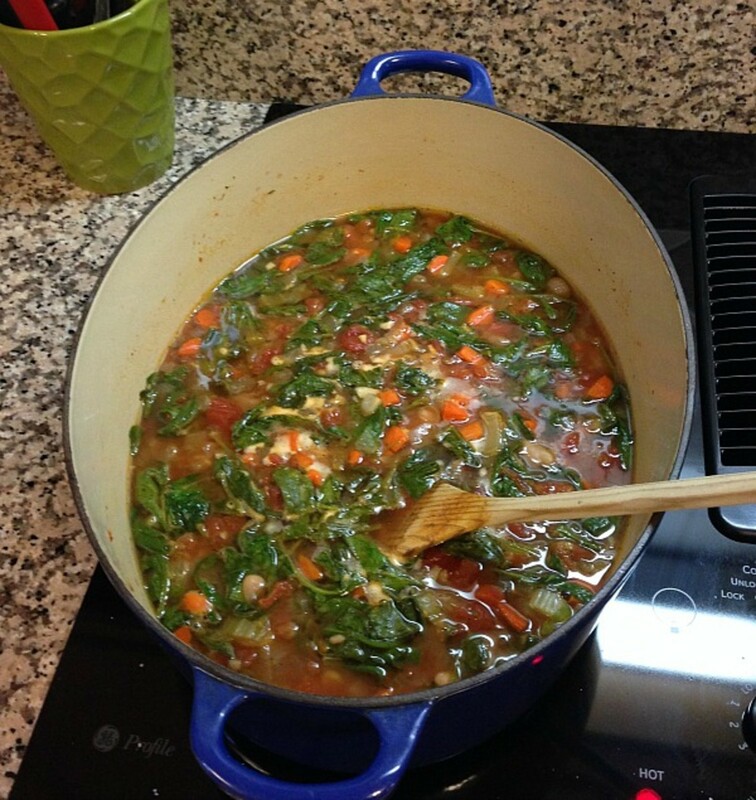 I had started the Spinach, White Bean and Tomato soup earlier that morning, to allow the flavors to become established, and we finished it off with the spinach before lunch. Since I completely forgot to buy puff pastry dough, I just made parmesan crisps on the Silpat in the oven for an easy and totally addictive garnish. We also made the beautiful and refreshing Winter Citrus Salad. The salad, the soup and the Cranberry-Rosemary Challah were our delicious lunch. Lastly, we let the kids make their own individual chocolate candy bark while the adults indulged in sinful Olive Oil Chocolate Mousse (which, had we not known it was non-dairy, we would never have guessed!). All in all it was a very successful little party. Hubby and I have recently relocated from Atlanta, GA to Richmond, VA and this was a great opportunity to meet new friends. 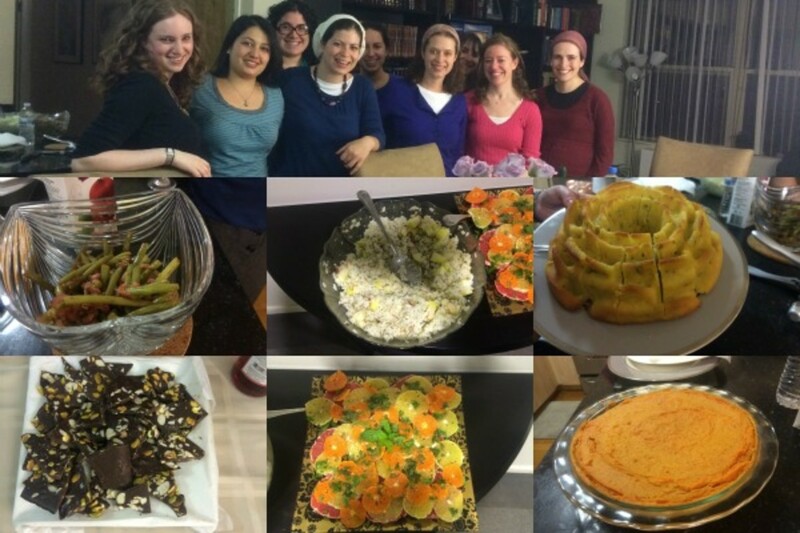 Since the Richmond community is very observant, having a kosher cookbook party was the ideal "Siba L&apos;Mesibah" (as they say in Israel). I have found my ideal Chanukah gift! 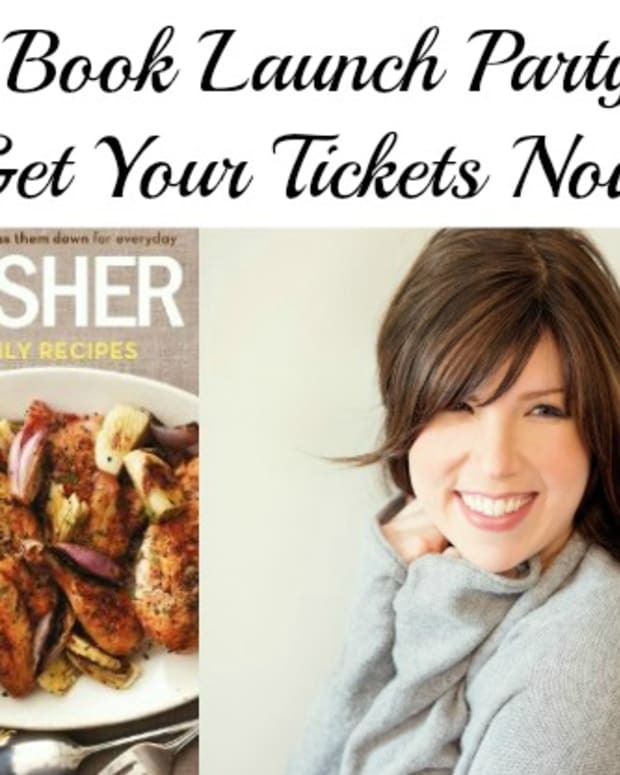 I was so excited to be asked to host a cookbook club party for Jamie&apos;s new cookbook, not only because I am a huge fan of hers, but also because I too went from a bride who knew nothing to an accomplished home cook. The moment the book arrived my kids and I poured over the recipes, deciding exactly what the best menu was for my friends. The recipes all looked so fabulous that I decided that I would cook everything and that I would assign each friend a wine, that Jamie recommended, that went with the dish. We decided on Avocado and mock crab salad with butter lettuce and lemon dressing to start, which was delicious. For the main course I made the Moroccan roasted chicken, which was definitely the highlight of the night, Easy cranberry and pine nut couscous... which was easy and tasty, mushrooms with herbs and wine in phyllo cups, which I cannot wait to make again and pour over a steak...., and then colorful mustard string beans, which looked as good on the platter as they tasted. To end off the meal, my friend Rachel, made the Nutty caramel brownies, which we all agreed were worth every extra calories! What I loved most about this cookbook, and I find consistent with Jamie&apos;s recipes, is that I was able to cook the entire menu that day and did not stand in the kitchen for hours!! My friends and I had a wonderful evening full of delicious food, wine tasting and friendship. I am looking forward to trying many more of the recipes. Here are pictures from Bryna Roth&apos;s Party. 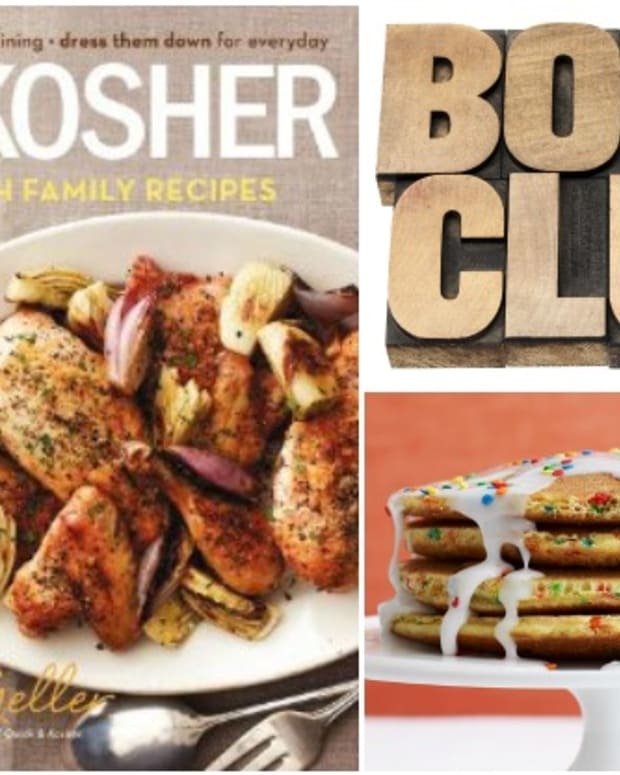 Now that you see how it is done, when are you going to host your own Joy of Kosher cookbook club party? If you attended one of these parties, add your comments below. Check out more pictures from all these parties and tag yourselves in our facebook album here. 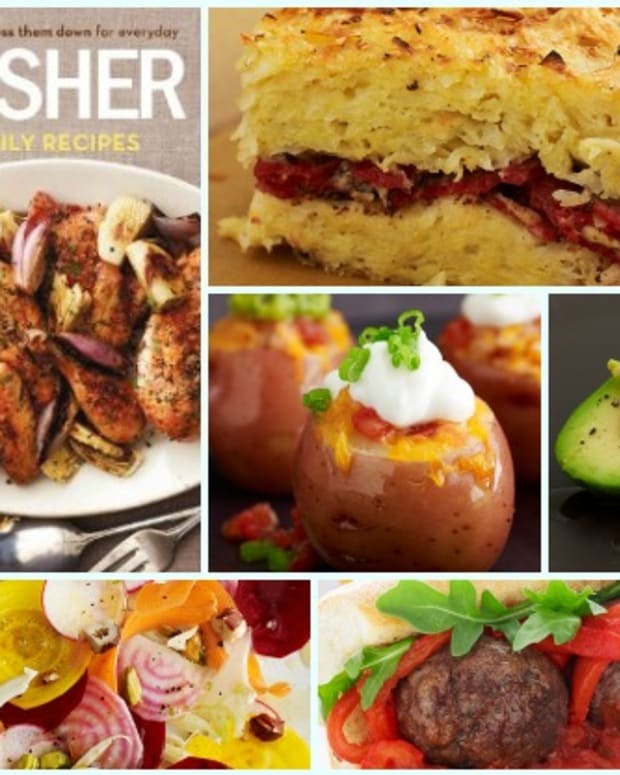 Order your copy and/or leave a review of the cookbook on amazon for The Joy of Kosher Cookbook.